Holiday is the favorite keyword for hardworking Americans, who never miss an opportunity to unwind and relax. With economy, going downslide and niche competition intensifying people have to work hard to keep their kitchen fires burning. Holiday is still a distant dream for many marketers. You can easily console and cajole them by sending away holiday 5×3.5 magnets. People would be happier that at least you gave them a reason to smile everyday during and after holidays in the December. You can mail holiday wishes magnets to your customers in the beginning of the season. Additionally, you should ensure that promotional magnet is printed with real images, which entertains and enchants them beyond limits. Couples looking forward to announce their big day in style would prefer save the date magnets because they set the mood and tone for the whole event. You can apply the same technique to buy your client attention from over save the date sales flyers. Steve Jobs didn’t employ this technique of asking people to save the date over promotional magnets, when he presented his first Mac computer to the world, but the image was a major crowd puller. 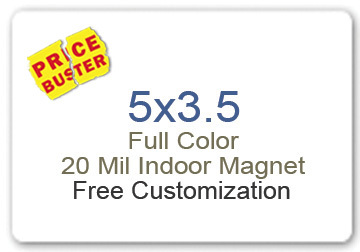 You can recreate the same crowd puller theme by smartly marketing over customized 3.5 x 5 magnets. As said before bad economic times are making people to count each penny they spend. You can easily wow your customers by offering the savings and discount much before they start shopping. Choose 3.5 x 5 magnets for making your announcement. Fundraising is becoming an important aspect of corporate brand building. Nowadays, big business corporations and small businesses are taking their social role seriously. They are always hogging limelight by sponsoring for charities and other events. You can easily reprise magic of those charity giveaways by gifting full color and impressive charity fundraiser magnets. Fundraiser magnets are perfect for gifting during fundraiser events or charity events or corporate events, school events and more. You can figure out many more ways of spreading brand awareness through customized 3.5 x5 magnets. Your final tally of conversions would reveal, whether your effort have paid or not. It would take some hard work and smart marketing strategies to make 5×3.5 magnets popular than Darth Vader (currently he is a most popular person than Hillary Clinton –a 2016 presidential hopeful). You will feel it all a part of a sci-fi movie, when you are really doing it by yourselves.